Like writers who are told to “write what they know,” Jan Steen painted what he knew. Having been raised in a tavern, what he knew was drunks. Though the drunks in his paintings always seem to be having a grand time, there is usually a moralizing metaphor hidden within the composition dissing his sloshed subjects. The Drunken Couple is no exception to Steen’s typical alcohol-induced allegories. An all-too-familiar scene for those of us who can actually remember our intoxicating college days, we see what appears to be the end of an after-hours house party. The hostess has passed out with a burning pipe in her hand while the host toasts an empty house, both unaware that their departing guests are in the process of stealing their stuff. If the thieves and burning pipe weren’t enough clues that these people are wasted to the point of idiocy, Steen has left the viewer additional hints. On the wall is a small picture of an owl, an image associated in the 17th century with stupidity because of their inability to see during the day even things that are close by. Like mice and burglars and junk. Additionally, cats were a common symbol of danger or misconduct in Dutch painting. So that concerned looking cat staring at its mistresses’ pipe? Definitely a warning to the viewer that this house may soon be as lit as its owners. Music? Check. Alcohol? Check. Female company? Check. 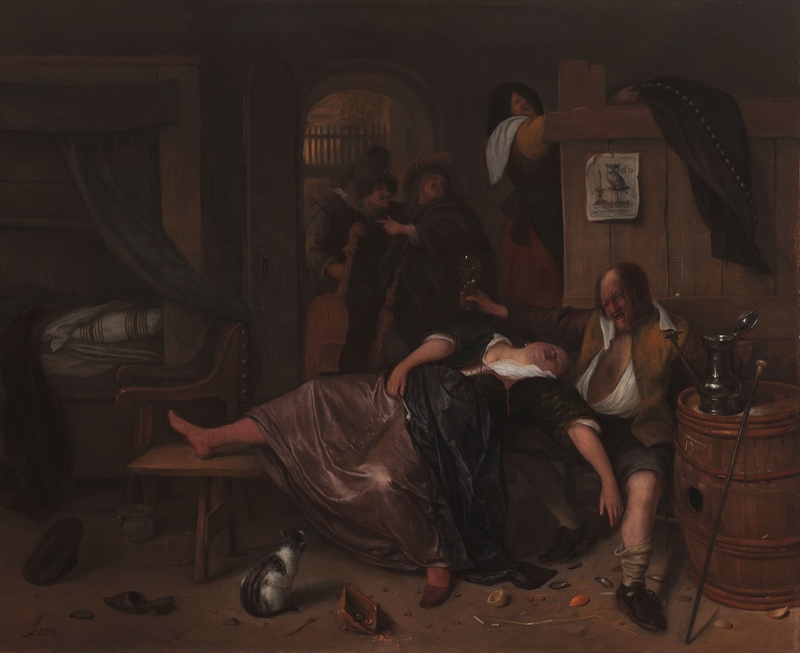 The Drunken Couple is a c.1655-1665 oil on oak panel painting by Jan Steen, now in the Rijksmuseum in Amsterdam. Adriaan van der Hoop left it and the rest of his collection to the city of Amsterdam in 1854. It was initially assigned to the Museum Van der Hoop before being moved to its present home on 30 June 1885. Check out the full Wikipedia article about The Drunken Couple.